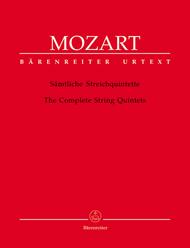 Complete String Quintets composed by Wolfgang Amadeus Mozart (1756-1791). Edited by Ernst Hess and Ernst Fritz Schmid. For violin I, violin II, viola I, viola II and cello. This edition: Stapled, Urtext edition. Stapled. Classical Period. Difficulty: medium. Set of performance parts (parts only, score not included). 316 pages. Published by Baerenreiter Verlag (BA.BA4771).ISBN 9790006456192. Classical Period. 9x12 inches. 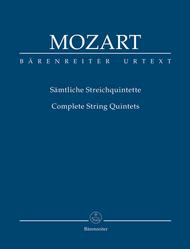 Complete String Quintets composed by Wolfgang Amadeus Mozart (1756-1791). Edited by Ernst Hess and Ernst Fritz Schmid. For violin I, violin II, viola I, viola II and cello. This edition: Paperback, Urtext edition. Paperback. Barenreiter Study scores. Classical Period. Difficulty: medium. Study score. Introductory text. 210 pages. Published by Baerenreiter Verlag (BA.TP159).ISBN 9790006201372. With introductory text. Classical Period. 6.5x9 inches.